Some of the completed houses at Setia Alam. Developers and banks are offering attractive mortgage plans for home buyers. For several months, a friend was checking out old double-storey terraces in Petaling Jaya. With a budget of about RM350,000, it was difficult to make a decision, as she would probably need to incur another RM80,000 for renovation. She came across Setia Alam in Shah Alam, liked the open space and quiet surroundings, and signed on the dotted line. What made her excited was the 5/95 campaign. “I pay 5% downpayment and will not need to start mortgage payments until the property is completed. The developer will bear all legal fees, stamp duty on the sale and purchase agreement, loan agreement, and memorandum of transfer. They will also service the interest during the construction period,” she says. Banks and developers today are working very closely to design mortgage plans for home buyers. The leanings seem to be towards developers with large landbanks, offering bread-and-butter housing like double-storey terraces. There are one or two tie-ups with developers offering high-end condominiums, but generally, these schemes do not come across as attractive as those offering normal housing. As the year unwinds, more developers are expected to come up with such packages. Probably because of their large landbanks and a wider market audience, developers of bread-and-butter housing are quick to work something out with their bank partners. SP Setia Bhd tweaked its marketing strategy after the fall of Lehman Brothers in September last year. Its 5/95 payment scheme, to run for three months from January 19, has so far generated about RM300mil sales in Selangor, Penang and Johor just five weeks into the campaign. The company has a sales target of RM1.1bil. For its 2008 financial year, it had RM1.4bil sales, with progress billings of unbilled sales at RM1.2bil.The company has a land bank of 4,000 acres. Sime Darby Bhd’s property division, which started its campaign since the middle of last year, is now on its third campaign. The campaign, which ends June 15, has so far generated about RM160mil sales since its launch on March 6. The campaign includes an interest rate of base lending rate minus 2.3% and the developer absorbs the interest during the construction period. Its first campaign generated RM246mil in nine days, while the second campaign achieved more than RM146mil sales. The speed at which market surveys were done by developers in the last quarter of 2008 and the strategies put in place in January, underscores the urgency developers view the situation. Whether it is to clear old stocks or to complement new launches, something has to give to lift the current sentiments. He adds that: “Never before have developers absorbed the interest. In the past, developers priced in the interest in the higher selling price, but now it is different. These are the units which could not move, so developers would rather lose out 2% to 3% margin based on the interest cost and stamp duties”. Whether these incentives are sustainable until year-end depends on how things pan out in the local and global economy, he says. He also cautioned that a lot of sales numbers given by developers may be just bookings, which have yet to convert into sales and purchase agreements. “We expect demand to remain weak notwithstanding the campaigns. The fact that there are such campaigns show that developers are in jeopardy. “A condominium developer had virtually no sales in the last quarter of 2008 and a large-scale developer had sales of only RM70mil in the last quarter, compared to RM300mil a year ago. So the incentives to buy must be there,” the analyst says. Another analyst opines that the larger boys offering mass housing may have a better survival rate. Those offering homes that costs millions may have problems this year. It all depends on their stock of these million ringgit homes. “(Demand for) luxury condominiums will only come back in 2010. More home buyers will return in the third and fourth quarters. We expect more creative approaches in the second quarter, but these incentives will also cut into the costs,” he says. The way things have turned out for developers and banks underscore the cooperation needed by both to tie over the period. A source from Mah Sing Group Bhd says sentiments are indeed very poor. “Banks have to do a lot of packaging if sales are to continue. If you are buying for own stay, now is the time. The fact that the second stimulus package allows banks to defer mortgage payments for one year indicates how concerned the Government is,” he says. “When there is job insecurity, people will not buy. Most developers will think twice about increasing prices. But developers in the right market and the right location will hold strong,” he adds. The company has achieved sales of about RM140mil following its 5/95 sales campaign for all properties. It has a sales target of RM450mil for 2009, a 13% increase over the previous year’s of RM397mil. 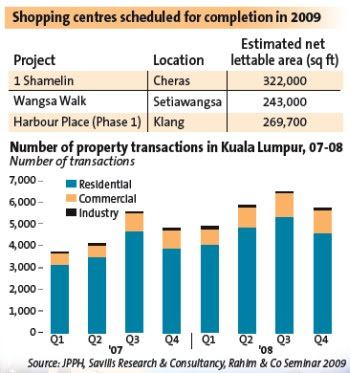 About 88% of the sales are from the Klang Valley, with nearly half from commercial properties. Mah Sing’s campaign ends March 31. There may be plans to extend or tweak the current package. Sunway City Bhd had two schemes, one for completed projects and the other for those under construction. Both ended Feb 28 and generated about RM60mil during the schemes’ two-week duration. BUYING a property and getting a housing loan to finance it is a major commitment for most consumers, as they need to ensure that they can sustain the payments over the next 15 to 30 years. It does not help that the current economic downturn is putting more pressure on consumers’ job stability, finances, and confidence resulting in most consumers putting off making such huge investments. Bank Negara statistics seem to reflect the weaker consumer sentiment, with the mortgage segment experiencing an 8% decline in loans approved in January versus December last year. Nevertheless, the recent reduction in banks’ base lending rate (BLR) to 5.55% per annum, as well as attractive promotions and packages offered by developers and banks, have raised some hopes that the tide will turn somewhat for the mortgage business. OCBC Bank (M) Bhd head of secured lending Thoo Mee Ling says although OCBC’s mortgage business was reflective of the industry’s in January, the bank’s monthly loans applications rose markedly by 27% in February compared with the previous month, with monthly loans approved increasing by 35%. “Indications are that the decline in BLR has indeed helped to bring in more business as suggested by the increase in loan applications and approvals last month. “However, these are still early days, and we will need to monitor trends over a longer period to adequately assess the impact that the BLR revision has had on the business,” Thoo says. 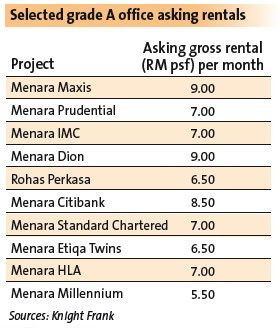 Banks have reduced their BLR and base financing rate to 5.55% per annum recently, following Bank Negara’s cut in its overnight policy rate to 2% effective March 1. Thoo believes that perks and incentives to make loans more attractive are often only short-term measures to stimulate the business. “In the long run, we believe that we should further attune ourselves to meeting customers’ needs through tailor-made products and services that meet their specific requirements. We have a range of innovative products that cater to the various, complex, needs of individuals,” she says. For example, OCBC’s HomeXtra package provides additional financing of up to 100% the loan amount for customers to meet their financial commitments. In addition, the bank’s LVS (legal, valuation and stamping fees) financing package allows customers to finance their entry costs, and at the same time enjoy lower interest rates. Entry costs represent legal fees, valuation fees and stamp duty on loan documentation incurred when the customer wishes to finance his or her housing loan. “Traditionally, customers prefer the fees-absorbed-by-the-bank packages, whereby they do not need to pay any entry fees; and this is despite the fact that such packages tend to be made available at slightly higher interest rates. “Still, with the recent introduction of the LVS package, we see a shift taking place – where lower interest rates are being valued more than other attractive fee-related benefits,” Thoo says. CIMB Bank expects to see a decline in the number of new loans booked as consumers adopt a wait and see attitude, and is projecting a lower target for 2009. Head of retail banking Peter England is optimistic the bank’s mortgage business will grow at least 13% this year. CIMB Bank’s mortgage business grew over 25% last year versus 2007. “The lower BLR is very attractive for people looking to buy properties. It is probably one of the lowest rates for the past few years,” he points out. CIMB Bank recently rolled out its Islamic Flexi Home Financing-i, which is linked to a special current account to enable customers to offset their outstanding principal with deposits. England says the home loan has contributed significantly to the growth in the bank’s mortgage sales, with RM200mil sold in the first month after the launch. “We are looking at rolling out another innovative product in the second quarter that will further strengthen our market share in Islamic property financing,” England says. At present, one-third of the total mortgage facilities booked by customers come from CIMB Islamic’s range of products. TA Securities senior analyst Wong Li Hsia notes that banks are still keen on loans growth and are very competitive especially in the mortgage segment. “To grow loans, banks tend to focus on two main areas - mortgage and loans to small and medium enterprises. The lower BLR could help to encourage borrowing,” she says. Wong expects mortgage loans to grow at a slower pace this year, as demand drops and banks are more cautious about who they lend to. “We are looking at a low single digit growth for mortgage this year,” she adds. The retail and office property market is looking stable at the moment despite some softening in certain locations due to the global economic slowdown. “The overall occupancy of most malls in Kuala Lumpur and the Klang Valley is still high, suggesting the market at this point is still remarkably resilient, compared with markets in other countries in the region,” says real estate agency Regroup Associates managing director Allan Soo. Based on the average occupancy tracked by the company for the whole of 2008, which includes 43 shopping centres, he says the overall occupancy for all the malls is holding well at 92.7%. He says that despite the overwhelmingly negative sentiment in the industry, the retail market displayed mixed results last year, with food and beverage and basic necessities like groceries showing positive growth trends, even in the gloom of the second half of 2008. However, this year, with the global credit crunch affecting the country, Soo says discretionary spending will be curtailed even more. He expects fashion outlets to be the most affected. Even so, he is still optimistic. “All the hypermarket chains are still expanding and gaining market share, with a few more outlets slated to open this year. Demand is still strong for traders in the convenience, family, household, and food and beverage categories. Our leasing efforts for our two main shopping centres, CITTA in Saujana and Festival City in Setapak, which are still under construction, have drawn positive response from tenants,” he says. Naturally, retailers that are already situated in strategic locations would choose to remain there, while those that are not will want to open shop in such areas. As such, Soo points out that malls like Suria KLCC and Mid Valley Megamall, which are still attracting strong sales, albeit slightly less than last year’s, will continue to maintain full occupancy in the next couple of years. Sunway Pyramid Sdn Bhd marketing and leasing general manager Kevin Tan Gar Peng says there is a misconception that malls are performing dismally due to the downturn. “Every day, we are reading news that say shopping malls are facing gloomy days. Actually, it is not that bad. Sunway Pyramid is doing well and retailers are enjoying good sales,” he says. The sales during Christmas last year and Chinese New Year this year had in fact fared much better than in 2007. “We are very optimistic. Our target market is medium to high-end shoppers, who are less affected by the downturn,” he says, adding that for the past six years, Sunway Pyramid has been enjoying full occupancy with an average rental rate of about RM9 per sq ft.
“We are very selective with our tenants. Some retailers may move out due to poor sales, but it may be because their products don’t suit the market and not because the market is bad,” he explains. Sunway Pyramid has raised its marketing budget by 30% this year to woo more shoppers. And apart from seasonal sales, it will have promotions for certain departments every month. Kuala Lumpur Pavilion Sdn Bhd leasing and marketing director Joyce Yap says Pavilion’s occupancy rate is 100% and, as tenants have signed a three-year leasing arrangement, it is not likely to change in the near term. Yap says that in this challenging time, malls need to do more promotions to attract shoppers and boost sales. Hall Chadwick Asia Sdn Bhd chairman Kumar Tharmalingam says the domestic office rental rates will hold as KL is not a financial centre like Singapore. “International banks (in Malaysia) are smaller and I don’t think they will retrench workers, while the local banks are not in trouble. In the last seven years, not many new office buildings have been erected. During that period, there was only one new building in the golden triangle, Menara Bumiputra-Commerce in Jalan Raja Laut, but businesses have expanded,” he says. He opines that the office market outside the KLCC vicinity, such as Petaling Jaya and Damansara Heights, are also stable. On a report that an additional eight million sq ft of office space will hit the KL market in three years, he says developers are more likely to defer the projects, which means there will unlikely be a scenario of oversupply. On average, he says, the take-up rate for new tenancy office space in KL is about 1.5 million sq ft per year. Among all the segments of the commercial property market, he says the office rental market is the most stable at this point. Regroup Associates Sdn Bhd executive director Paul Khong says the office market is still fairly strong, as renewal of existing leases are on the rise. However, he says new tenants may resist paying premium rates, or commit to new spaces, until economic conditions improve. As such, he expects office rental yields for buildings in secondary locations, or newly-completed office space that are struggling to draw tenants, to taper off by 5%-15%. “Unless they see a bargain, they won’t be willing to part with their cash yet. There may be one or two desperate sellers, but it should not bring down the entire market substantially,” he says. “As part of cost-cutting measures for back-end offices or data centres, there could be demand for office space from multinational corporations looking to relocate from more expensive countries like Singapore or Hong Kong to Malaysia,” he says, adding that the general occupancy rates for grade A offices are above 90% and about 40% of the new supply of office space coming in are already pre-let. WHETHER it is foreign or local shoppers who are spending, the cash registers of the Klang Valley’s super high-end malls continue to ring. It may not ring as frequently as during buoyant times, but malls like Starhill, The Gardens and Pavilion continue to enjoy fairly good overall sales, says Regroup Associates and Henry Butcher Retail Sdn Bhd. Henry Butcher Retail says low shopping traffic in some malls does not mean they are not doing well. “High-end brands do not need high traffic to remain profitable because they have high profit margins,” says its managing director Tan Hai Hsin. “The Gardens and Pavilion are very different from ordinary malls like 1 Utama and Mid Valley Megamall. They are of a different class, offering a different set of products and services,” he says. Over at Regroup, managing director Allan Soo says it is the foreigners who are buying, not the locals. “How many rich (people) do we actually have? Will they not go to London, Milan or Singapore?” Soo asks. He says a third of shoppers at KLCC are foreigners. Over at Pavilion, 40% of the shoppers are foreigners, while The Gardens will need a lot of time to adjust to the environment. It does seem rather unfair to tie the current low-traffic scenario at The Gardens and Starhill to the global crisis. Starhill has generally lacked the masses seen at KLCC or Mid Valley Megamall. The Gardens is fairly new and its prices are rather prohibitive. But this does not mean there is no market for it. It is, after all, pandering to the whims of a small group of people, whose pockets are well lined. “The current purchasing power of Malaysians is still not high enough to support these upmarket malls at the moment. But with time, they will be fine. The other issue is market saturation,” Soo says. Both Soo and Tan agree that there are too many malls in the Klang Valley. Ideally, there should be between 30 and 40 malls compared with the 120 big and small ones today. Because of the different categories of malls, the downturn is affecting different players in different ways. By and large, retail sales are not as bad today compared with the Asian financial crisis in 1997/98, both of them say. At the upper end of the retail spectrum, some top brands are still enjoying good sales due to customer loyalty. Although sales of some high-profile international brands have dipped between 10% and 40%, it started to happen even before the crisis hit in late September. “It is market saturation more than anything else,” says Tan, who categorises malls such as The Gardens, Pavilion, Starhill, Bangsar Shopping Centre, and Bangsar Village as attracting mostly upper-income Malaysians and tourists. The AEON shopping centres are mostly located in residential areas and cater to the community they are located in, regardless of income group. Tesco, Carrefour, Giant and Mydin hypermarkets, meanwhile, offer grocery shopping which attracts families. 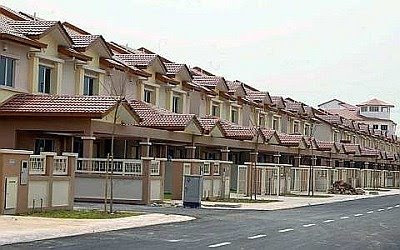 The Real Estate and Housing Developers Association (Rehda) yesterday suggested that the government take over the building of low-cost houses, now a compulsory thing for private developers. Its president Datuk Ng Seing Liong said the step will be effective in helping the private real estate and housing sector tide through the rough times. “We also hope the government will offer more incentives to stimulate this sector,” he said after opening the Mapex exhibition Kota Baru yesterday.